I'm due with my 2nd son in April. My husband and I cannot find a name we love. We like unique names. If we know of someone with a name, it's out. Our first son is Aeson, our last name is Cook. I've studied probably a million names and am at my wit's end. Help! If you're at your wit's end, then you were wise to rub the lamp. The name Thaddeus Deon should prove to be the unique name that has eluded you. I am expecting a girl and finding it really difficult. We have one boy and his name is Elias named after a relative. Our family name is Sarkis and I need the baby girl name to be related to Mary or Maria. Thank you. I'm sorry you're finding it difficult to expect a girl. Don't worry, she'll grow on you. In the meantime, I have a beautiful Lebanese name for your daughter: Mariam Kitra. 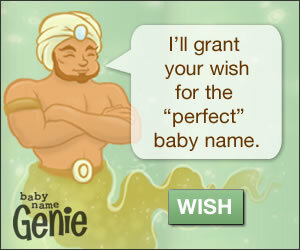 Dear Genie, I'm having a super hard time agreeing with my hubby on a name. I love hippie names, but he likes old classic names. Do you know of any old classic hippie names for each gender. If it's a boy, his middle name is James, If it's a girl her middle name will be Roxanna. What child doesn't want to be named after an aging hippie? Please take these life affirming names and live in harmony with your brothers and sisters: Marley James and Star Roxanna. Peace out. My wife is having our fourth child in a couple of hours, it's a girl and we have picked out Shiloh as a middle name, any advice on a first name? Our last name is Gonzalez by the way. Looking for something with a nice ring to it...thanks! A couple of hours? Nothing like waiting until the last minute. I am tempted to give you Speedy since you are in such a rush, but somehow that doesn't seem right for your little girl. Instead I give you Elena Shiloh Gonzalez. I'm having a little girl and I have no clue what to name her all because of her last name. Her last name will be Dunklee so it's hard to find a cute name. I want something really girly like Brookelynn or Mackenzie but I just don't know with a last name like Dunklee. Sometimes simple is better when going for elegance and charm with a difficult last name. I give you Bryn Elizabeth. Names ring cuter when the child herself is sweet and polite. Hi I am 35 weeks today with baby boy, been through every single name in every culture and can't decide. Dad is Michael, little sister is India Skye and surname is Thomas. Please help!! It needs to be strong, to go with Thomas, but not overused, and not weird to spell to everyone. I'm still trying to figure out how your unborn son already has a little sister, but perhaps you do things a little differently in Sydney. No matter. I give you Dexter Orion Thomas for a name that's sure to impress down under. Wonder Wonder Genie. Would you do us the honor of helping us name our children because we are kind of failing at that part of parenthood. My husband is kind of a classic type and I am more of a.... unique type of person. And we are incredibly lucky to be having twins. A boy and a girl, last name Lockheart. To satisfy both lovers of classic names and lovers of unique names, the clear solution is finding obscure older names. Your twins will be the only kids on the block with the names Lavinia Rose Lockheart and Chauncey King Lockheart. Me and my husband Roosevelt have a girl named Liberty, but we are going to have a new member to the family. We know it's a boy, but Roosevelt wants a president last name to keep the family tradition. Any ideas? Yours truly, the Bensons. Finally! A parent that will take my suggestion of Van Buren seriously. Though, I sense that name still may not suit you. Instead, name your son Truman for a suitable successor to Roosevelt. Okay so me and my hubby met in 2002, got married on 02/22/12, our house number is 2, and now we are pregnant with twin boys! But we can't agree on two perfect first and middle names! We have two daughters, Eva Lilly and Lacie Faye, so they need to go well with them and our last name Newton. Thanks. What the deuce? Talk about the Terrible Twos! You're going to need some help on the double. I've paired down the list to give you some names that are twice as nice:Jacob Daniel Newton and Caleb Matthew Newton. I need a short unique middle name to go with Juniper Kendall. Thanks! A tree cannot grow without the sun, so for a unique middle name, I give you Juniper Sol.